Years ago I had a job where I used the program Visio to create flowcharts. The program was in its early stages but the power of organization was wonderful. I could move the shapes anywhere I wanted and I could easily see the workflow that I was after. The nice thing was the ability to quickly move things around. 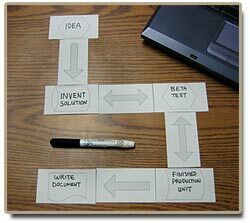 That is the power of the, “Five Minute Flowchart.” Print a half dozen business card flowchart sheets, break them apart, grab a Sharpie, and have fun. You’ll soon have a business card flowchart on your desk. Then you can start moving things around. Don’t like this card here… then move it. Grab a different colored Sharpie and mark things up. Have fun… break the rules. Make yourself the CEO and add others below you. Send the workflow downstream. Create your own corporation. This Microsoft Word based template allows you to add text from the computer or you can print them blank and enter text by hand. The template includes the 10 most popular shapes and arrows for basic flowcharts. You can cut and paste different shapes in your template to modify them the way you want. Add color and texture for added emphasis. Once you have modified your template and printed it out, break all the cards apart and clip them together with a mini clip. Take this Flowchart Walleter to your next business meeting and wow your co-workers. People will be amazed at your creativity and organizational prowess. Pass out some cards and Sharpies and have a flowchart party. The creativity will soar and you just may find the answer you were looking for. Bottom Line: Have fun and be creative. I have found that this little tool is very helpful for many projects.